If you haven’t done any debugging with microcontroller programs [Kphlight] posted a follow-along guide for debugging MSP430 chips. You can see above that he’s using the TI Launchpad and has chosen the free (but code limited) IAR Embedded Workbench that is one of the IDE’s that TI provides for the kit. 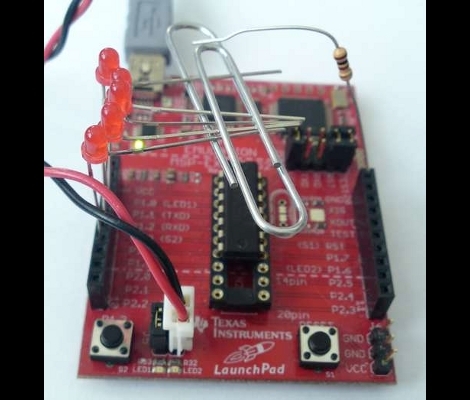 The example builds a Pomodoro timer with just five LEDs and one resistor. You’ll flash the code to the chip, step through each line of the firmware, and learn how to manipulate register data during code execution. It’s a great primer for the uninitiated, and we’d love to see one using open-source tools like DDD and GDB. If you do write one, don’t forget to send us a tip about it. If you want to give open source a try with this hardware check out our own tutorial. Loving the picture with the paper clip! I prefer CCS over IAR. Kphlight, have you used both? If so, I’m wondering why you prefer IAR? I’m not saying CCS is better. I’m just wondering if I should give IAR another look. Reminds me, I probably should take my TI launchpad out of its box and use it for something. Oh good timing, a couple weeks ago I ordered two Launchpads for my first ever foray into microcontroller programming. Debugging resources are a plus! c liked pcbtc (GaN edition). will.barrows liked PCB stepper motor. wyzarddoc liked Open PCB Tesla coil. will.barrows wrote a comment on TALON Omnidirectional EV. mihkel has followed a list. Isa Twospirit wrote a reply on Project 72 - Korg DW-6000 wave memory expansion.